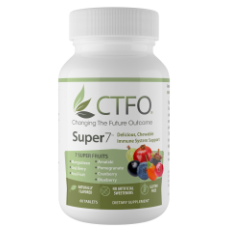 CTFO’s Super7 is a delicious chewable combination of these seven superfruits. Just chewing two a day may help you maintain a stronger immune system. The chewables are naturally flavored and contain NO artificial sweeteners. They are also gluten-free. There is 325 mg of a proprietary superfruit blend in every one! Chew one in the morning and another in the afternoon for an energy filled day!